PITTSBURGH—The Defense Advanced Research Projects Agency (DARPA) today announced that a team from Carnegie Mellon University's National Robotics Engineering Center (NREC) is one of six Track A teams chosen to compete this December in trials for the DARPA Robotics Challenge. The Track A teams, which are building their own robots for the competition, join seven previously announced Track B and C teams that will use humanoid robots supplied to them by DARPA. 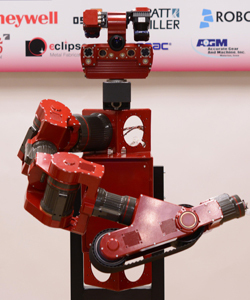 The NREC team is now assembling its four-limbed robot, called the CMU Highly Intelligent Mobile Platform, or CHIMP. The human-size robot is designed to perform tasks, such as climbing ladders, driving vehicles and closing valves that must be accomplished during the DARPA Robotics Challenge (DRC). The DRC was created by DARPA to spur development of advanced robots that can assist humans in mitigating and recovering from future natural and man-made disasters. The trials in December will be the first physical competition of the DRC. A final event is scheduled for December 2014. "Designing and building a robot as sophisticated as CHIMP in a matter of months is an enormous undertaking, but we're accustomed to meeting that kind of challenge at Carnegie Mellon," said Tony Stentz, NREC director and leader of the Tartan Rescue Team. "DARPA's decision is a big vote of confidence and our team is excited. We can't wait to get on with it." With four limbs and a head-like sensor array, CHIMP will look vaguely simian. But the way it will move around — on rubberized tracks at the end of each limb — is more comparable to a tank. CHIMP normally will travel with all four of its tracks on the ground, although it can stand upright and move on the treads of just two limbs when it needs to turn valves, operate power tools or perform similar tasks. CHIMP's head and two upper limbs have been built and the remainder of the robot will be assembled this summer. The robot is five-feet, four-inches tall (four feet when crawling) and 2 1/2 feet wide, but will weigh just more than 400 pounds. Software developers have been writing code to control the robot for months, using a stand-in robotic arm and computer simulation for testing. The robot will be able to perform the demanding tasks of the DRC through supervised autonomy - receiving high-level commands from a remote operator while employing its own intelligence to maintain stability and keep itself from harm. The remote operator will be able to visualize and map the environment where the robot is working using immersive 3D sensing and perception systems developed by the NREC. The robot will be able to perform certain tasks autonomously. Like other Track A teams, the Tartan Rescue Team is receiving some financial aid from DARPA. But the team is seeking sponsors to help cover additional costs necessary for building the robot and fielding the team. Major sponsors signed thus far include Kollmorgen, Faulhaber, Honeywell, Pratt & Miller, Robotiq, Oshkosh, THK, Harmonic Drive, Elmo Motion Control, Eclipse Metal Fabrication, Sepac, AGM and Bren-Tronics. The National Robotics Engineering Center, part of Carnegie Mellon's acclaimed Robotics Institute, performs advanced applied research and develops prototypes for a variety of corporate and government sponsors. The NREC and the Robotics Institute are part of the School of Computer Science. Follow the school on Twitter @SCSatCMU. With four limbs and a head-like sensor array, CHIMP (pictured above) will look vaguely simian. But the way it will move around — on rubberized tracks at the end of each limb — is more comparable to a tank. CHIMP normally will travel with all four of its tracks on the ground, although it can stand upright and move on the treads of just two limbs when it needs to turn valves, operate power tools or perform similar tasks.